I have four small closets in my house that I keep my clothes in. One of those closets is so small that it is more like a little nook than a closet…plus I have to share half the space with my husband. That closet holds all my folded items like jeans, shorts, and tee-shirts. Then I have a small coat closet, a current season closet, and a past season closet. When I was packing for my Colorado vacation and I looked at the cool temperatures, I was forced to go to my past-season closet and pull out the winter clothes. One of the items I took with me was my leopard print sweatshirt. The last time I wore it was way back in November 2014, and I wore it with grey skinny jeans, and black boots. You can see that look HERE. Looking back on that post I can't believe there was snow on the ground on November 21st. Ugh! I am so going to enjoy my summer before it is gone once again. 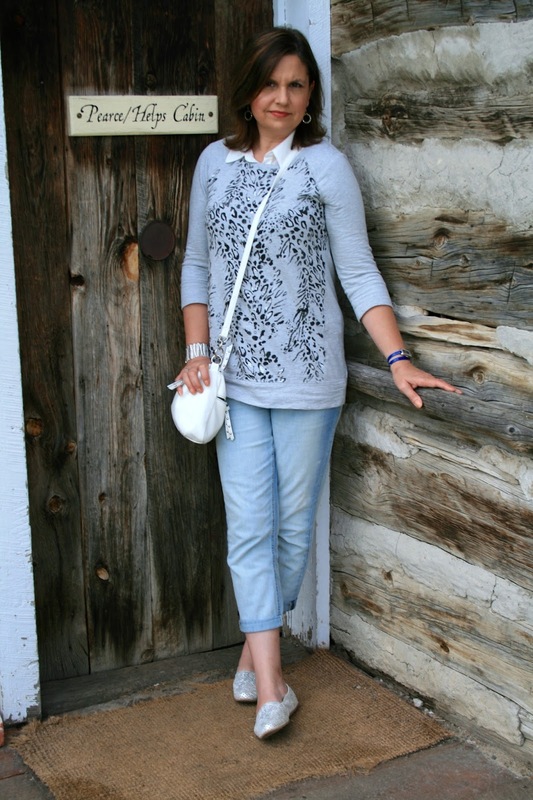 This time I styled my sweatshirt with light denim boyfriend jeans (a.n.a at JCP), and metallic flats (old). I also wore a white collar shirt underneath in case it got warm enough and I wanted to take the sweatshirt off (I did). Sweatshirts aren't just for winter. They are perfect for layering on those cool spring/summer mornings and evenings. You can always take them off and tie them around your waist if you get too hot, or put it your bag or car till you need it again. My jewelry is silver hoop earrings, a silver feather cuff, and a blue watch. I carried my Wilson's Leather white cross body bag. The sweatshirt has little metallic flecks in the print, so it is a bit dressier than most sweatshirts, which I like. It also has a longer length, which is more slimming than your typical sweatshirt that bunches at the waistline. Linking Up With: Casual Friday, Friday Favorites, Fashion Should be Fun, Favorite Fashion Friday Passion for Fashion,,and Mix It Up Friday. Cute look, love the silver shoes! This outfit looks really comfy and still stylish! Love the style of this sweatshirt. I am not a fan of the bulky ones either. I love the print of your sweat shirt! Unfortunately, here in Louisiana, we don't have any cool mornings! 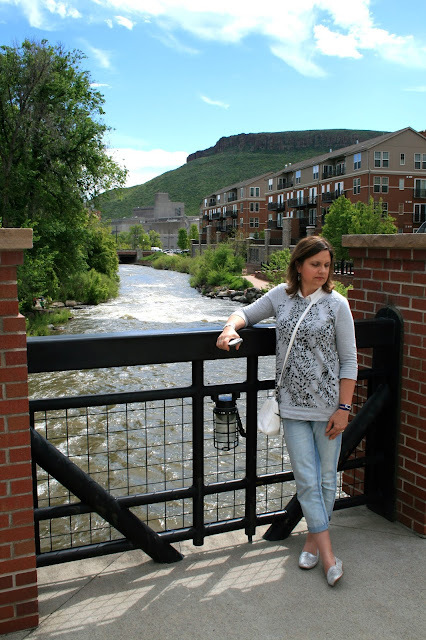 Loved your Colorado post! My parents just got back from visiting there for like the umpteenth time. Y'all went to some of their favorite places! Glad you had a good time! I can relate to your closet dilemma! I have an ok sized closet, plus two big dressers all to myself but it's never enough! Love your metallic shoes! So cute!